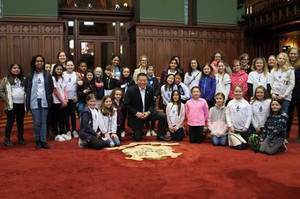 Hartford, CT - Senator Hwang welcomed over 45 middle school girls on Wednesday for a series of tours showcasing Connecticut’s legislative history including the Capitol building, the Supreme Court and History Museum. The day closed with a panel discussion and question and answer period featuring several female legislators and leaders. At a time where the nation is seeing a rising tide of women running for office, Senator Hwang believe events like these allow young people to see firsthand how their voice makes a difference and that there are leadership opportunities they can strive for. Ms. President US was founded in Ridgefield, CT in 2016 and is a non-partisan, non- profit, community-based initiative dedicated to inspiring and preparing girls to aim for the highest civic leadership positions with the knowledge that they can achieve them. "Ms President US is fortunate to have the opportunity to show our 4th-8th grade participants, first hand, how CT government works. In their monthly meetings they have already met with their local leaders, and heard from their state leaders. This is a chance to now see them in action at their workplace,” said Amanda Cordano, Project Manager for Ms President US. “These girls are already passionate about politics, and will no doubt have many questions for the politicians they meet during their day in Hartford. This is the next generation of leaders in the making, and offering this level of personal political exposure affords them the chance to visualize themselves in the heart of the action. These girls are at the unique age of finding their voice, which hopefully leads to a lifetime of civic engagement. Ms President US hopes to instill in them the confidence and knowledge in themselves to follow their passions, right to the steps of the White House." State Senator Tony Hwang represents Connecticut’s 28th Senate District which includes the towns of Fairfield, Westport, Weston, Easton, Newtown & Sandy Hook.